This particular anchor was found from the River Thames, at Blackfriars. It was made sometime between the 9th and 11th century. It is dark gray in color, has a broken shank, a crown in which is fitted and pierced with a loose ring, and pointed flukes. The anchor's purpose is to connect the vessel to the bed of a body of water. This prevents the craft from drifting, whether it be do to winds or currents. 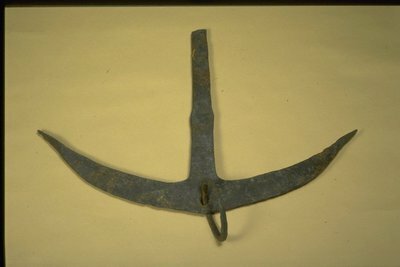 The shank is broken and the anchor is half its normal length. It may have been used for a large sea-going vessel. 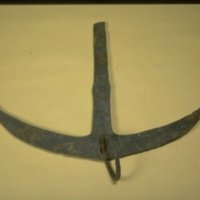 “Anchor ,” Medieval London, accessed April 22, 2019, http://medievallondon.ace.fordham.edu/items/show/92.